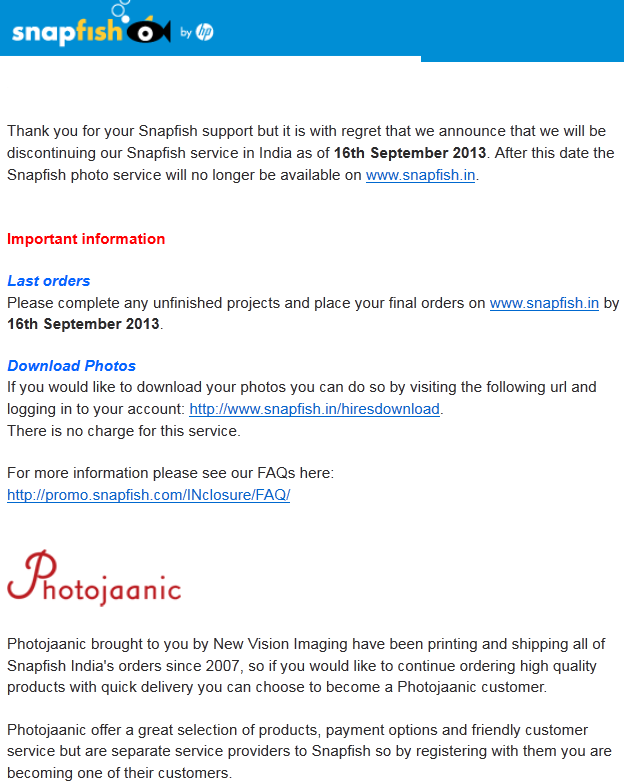 SnapFish – India, a unit backed by HP, the giant in the field of photo and printing industry have decided to closing its India services from 16th September 2013. After Flyte service from Flipkart, this is one of the other major business in terms of E-Commerce and India marketplace, is closing down. They offer various kind of printing services which includes traditional photo printing at very affordable rates. There are several free copies (mostly 10 copies of 4X6 photos) available with a new registration. In addition they offer several personal photo gifts like canvas, mug, magic mug, mouse pad, calendar and many more, in high quality material and best quality printing. They are cheaper (especially in regular size photo printing) than the local shops! Well, there are no more information is available officially apart from being it a result of a business reason. It is worth to note that SnapFish services are available in USA, CA and many other countries and so far we have found any specific announcement for those countries as of now. It is also worth to note that in India there are a lot of other websites offer such services (especially personalized photo gifts), and the number of local businessman in various cities have started offering such services. And in the time span of last one-two years they have slashed rates to compete with such online services. And the local vendors are able to serve the stuff more speedily, the online businesses have affected with the same as one of the reason. Also Indian marketplace is quite different than the International. For example SnapFish Canada is offering personalized photo (wall)clocks which was not available in India ever (by them). If you are a registered user at snapfish.in, this is the first question come to your mid is “what you can do?”. Well, the answer is simple, place all your orders before the deadline date. You can download all your photo, photo albums and other projects within the grace period (till 16th of Sept 2013). It is advisable you can delete all your stuff from your account on your own and close it before the limit date arrive.